Below are considered some of the best bird watching spotting scopes for 2019 by price range. Don't Get a Birding Spotting Scope for Less Than $100! 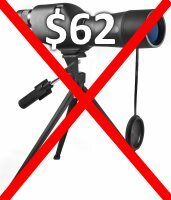 Just one thing before we proceed...I plead with you not to buy a spotting scope for birding that is priced less than $100. They will cause you eye strain and even worse, severe frustration. Cheap scopes may be good for looking at an elephant 100 yards away or to see your 22 cal bullet holes in your paper target at the range, but they are not made for bird watching. You're better off just looking through your binoculars than using such a scope. One exception would be for someone who just wants to look at backyard birds from their deck and/or take photos of them and doesn't want to hold binoculars. Good. Now that I got that off my chest, we can proceed. If you want to learn more about choosing spotting scopes for birding and their features, first go to Spotting Scopes, Part I. Most of the scopes listed below come in both angled and straight models. Its up to you and the kind of viewing you mostly do. 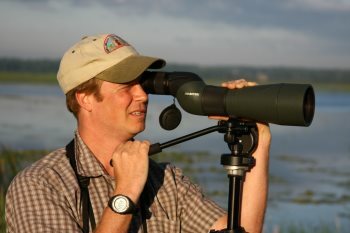 Click here for reviewing the pros and cons of Angled or Straight bird watching spotting scopes. Also, most scope models are available in several different objective lens sizes. It all depends on your personal needs. Click here to review objective lens sizes for bird watching spotting scopes. 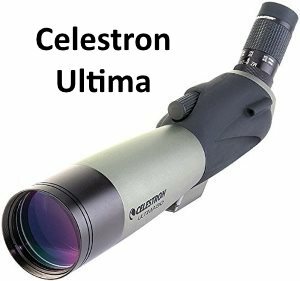 The Celestron Ultima Zoom Spotting Scope is an refractor-style scope with an 80mm objective lens with built-in zoom from 20x-60x. It comes in both straight and angled designs (see all listings below). If you want an entry-level scope, this is a very good choice. The only drawback is that the scope does not have the more expensive ED glass which helps prevent blue fringing at the higher magnification. The Celestron Ultima also has other options available such as a 65mm (cheaper) and 100mm (more expensive) objective lens and also comes in both angled and straight models for each of the sizes. The bigger the objective lens, the greater the light-gathering capacity of the scope, but it also increases the weight. If you do a lot of low-light birding (i.e., at dawn and dusk, in cloudy locations, etc.) then you may want to get the 100mm size. But for most conditions, the 80mm will be plenty. We wouldn't recommend getting the 65mm in this scope since this is a lower-end scope without premium optics. You can review more about objective lens sizes here. And again, if you're not sure if you want a straight or angled scope, read our quick tips here about choosing scope body design. Here are all the Celestron Ultima model choices in angled and straight bodies with either the 80mm or 100mm objective lens. The Diamondback is an exceptional scope at this price point. 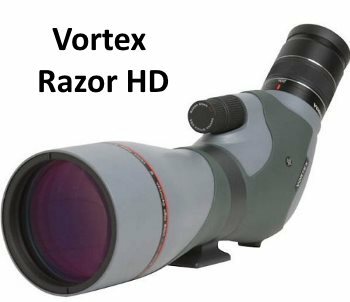 It is Vortex's lowest-price model compared to the Viper HD and Razor HD spotting scopes. The Vortex Diamondback line comes in both straight and angled models in both 60 mm and 80 mm objective lens sizes. It is a full-sized scope in a compact design, weighing less than most spotting scopes in this size at only 33.8 oz and 47.1 oz for the 60 mm and 80 mm lenses, respectively. We recommend the 80mm lens which will always give you that added brightness edge, especially valued in low-light conditions. And not for nothing, we really love the view-through case that actually is easy to use and view-through because of its generous-fitting design. "I purchased the Vortex Diamond back 20-60x80 spotting scope after comparing to other high end glass and I have no regrets. It has performed as expected and love the brightness due to the 80mm objective lens." Vortex will repair or replace the product in the event it becomes damaged or defective. Absolutely free—no matter the cause! 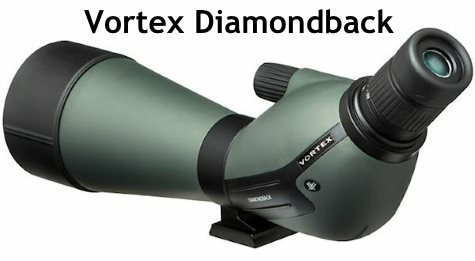 →Our new pick in this price range is the Vortex Diamondback 20-60x80 Spotting Scope as noted above. Or jump to the Semi-Budget Spotting Scope category below. The Alpen Spotting Scope Kit comes in both angled and straight models with an 80mm objective lens and a 20-60x zoom eyepiece. This is a great budget birdwatching scope for under $400. They also have a 60mm objective lens, but we recommend the 80mm for brighter images. 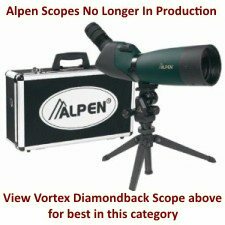 "My wife and I are avid, avocational birders, and we have just returned from a three-week driving trip to Florida and back, during which time we gave our Alpen 20-60X80 Spotting Scope its maiden voyage in many diverse birding habitats. We found everything about this instrument to check out perfectly with all of its advertising and reviews. The kit comes in two versions - either with a nylon padded case or foam-filled aluminum case. 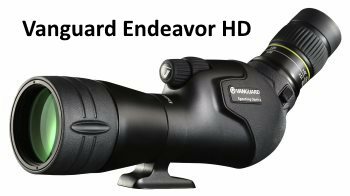 The Vanguard Endeavor HD Spotting Scope is an amazing bird watching scope for its size and price. Birders have been impressed with this one and love that it's light and compact for on-the-go birding adventures. 65mm or 82mm Objective Lens? The Vanguard Endeavor comes in both 65mm and 82mm sizes. Unless you plan to do a lot of digiscoping or will often be in low-light conditions, we think the 65mm objective lens is suitable for most birding situations, especially with the ED and multi-coated glass. This smaller lens and resulting lighter weight will also be appreciated by those who plan to carry it a lot. "This is a great scope for amateur and pro-birders alike. The construction is solid and the design is awesome for the price. You can easily spend twice the amount for a scope and still not get all of the features this one has. I normally post a Pro/ Con list, but I can't find any cons! The Vortex 20-60x85 Razor HD Angled Spotting Scope is a high-quality bird watching spotting scope and an excellent value at that in this price range. Premium Extra-Low Dispersion (ED) glass for exceptional viewing in low light conditions. The Kowa TSN-800 Series is one of the best bird watching spotting scopes money can buy. The TSN-883 is the angled body model, TSN-884 is the straight body model. Crystal clear clarity from Kowa's unique Prominar pure fluorite crystal lenses is just the beginning. 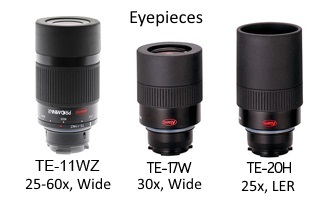 3 eyepieces available: TE-11WZ (25-60x, wide zoom), TE-17W (30x, wide) TE-20H (25x, LER - long eye relief). There is an eyepiece locking mechanism to prevent accidental release. Note that the TE-11WZ has replaced the older TE-10Z (20-60x, zoom) model. The stills and video below were shot using a Panasonic GH4 Micro Four Thirds 4K Camera. 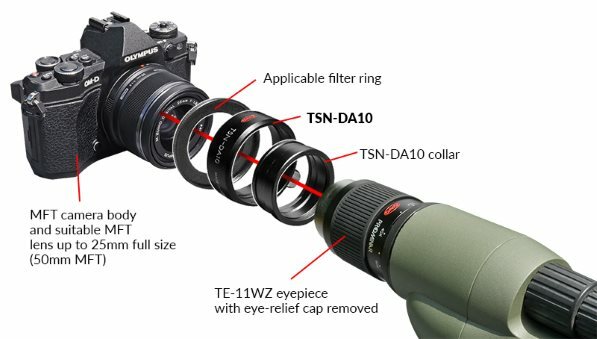 The Kowa TSN-DA10 digiscoping adapter is made for Micro Four Thirds camera system bodies and Micro Four Third compact lenses up to 25mm focal length (full size) (50mm MFT equivalent) and can be combined with the Kowa TE-11WZ eyepiece. Set-up is simple (takes less than a minute) and you can easily switch between landscape and portrait positioning as well as quickly slide the adapter off for normal observation. The DA10 fits lenses with a 43mm filter thread. If your lens has a different size filter – simply add one of our adapter rings - AR28/30/30.5/37/43/46/52/55/58/62/72mm between your lens and the DA10. All camera functions remain including camera lens auto-focus and focus peaking. Even an iPhone delivers stunning footage and photographs through the Kowa-TSN 883. Seeing your life-bird as a crystal-clear, razor-sharp image, even in low light... Priceless! Below in the product widget are all of the best bird watching spotting scopes in the 5 price ranges: Super-Budget, Budget, Semi-Budget, Mid-Priced and Best of the Best. 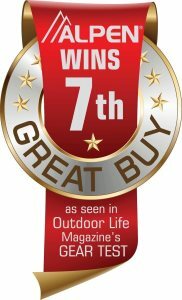 We also listed the Nikon Prostaff 5 Proscope 20-60x82 in the Semi-Budget range as a good second choice in that category. We have found that Amazon typically has the best prices, including shipping which is usually free. Learn how to choose the best birding spotting scopes and spotting scope features.